The colors of this rainbow especially right near the top were so bright. IT was just an amazing sight. Then as I rounded a curve and that rainbow moved behind me, I was treated to another gorgeous sight as the sun was lightly peakng through the clouds. It was one of those scenes where it just looked like Heaven is making its way through the clouds. It was filled with such peaceful energy. Then as I rounded another curve I saw the mountains lit up in such a wonderful way from the rays that were sneaking through the clouds. It was like the Universe was just laying beauty out all over the place for a feast for my eyes. I was filled with such love and such peace. Everything in these moments was just perfect. 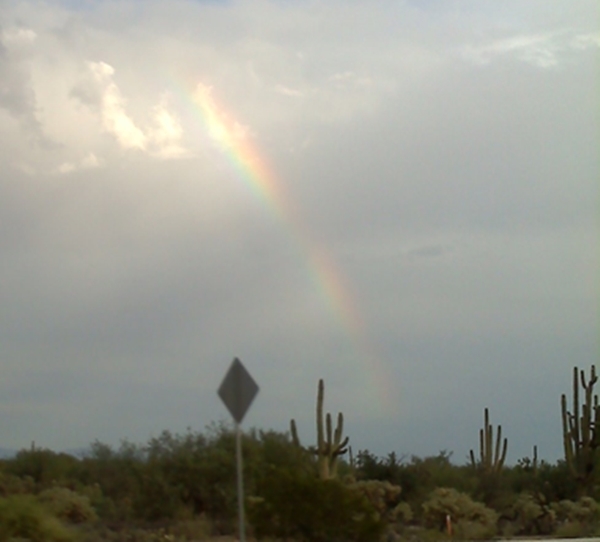 Then I turned on the freeway and was surprised by another rainbow. This rainbow was in front of me and it seemed like I was driving right into it. I cannot fully explian the feelings I had on this drive home. I was just filled with a knowing that happiness and joy are going to plant themselves in my life. I am not sure why I was treated to such sights but I am grateful for them. I just know that great things are on the horizon for me and I am so excited to see what they are. It was an absolutely magical drive home.